I'm in New York City speaking to several groups of CEOs about creating demand. I love New York City - there's so much to do, so many people to see (and watch) and so much stimulation. It was a beautiful evening, so instead of taking a cab or the subway back to my hotel I decided to walk. 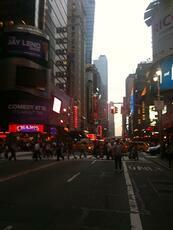 I arrived in one of my favorite places - Times Square. 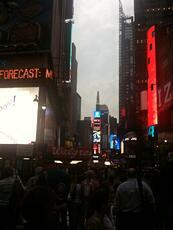 I'm awed by Times Square. How could so much end up in such a small place? Think about your company, your products and services - what would you do if you had to compete in Times Square? How would you gain the attention necessary? Guess what - you do compete in Times Square. Today, there is so much stimulus competing for less and less attention. Today, you must earn the attention of any one you wish to communicate with. To do that, you must create value all the time. So the next time you reach out to prospect, ask yourself - are you creating enough value to deserve their attention?